Why Cheat India Movie Review:Exposes flaws in the education system. Home » मनोरंजन » Why Cheat India Movie Review:Exposes the malpractices, scams and flaws in the Indian education system. Why Cheat India Movie Review:Exposes the malpractices, scams and flaws in the Indian education system. If you’ll watch ‘entertainment as entertainment’ you’ll find the following things good – Emraan Hashmi’s wickedly amazing presence, very smartly penned hilarious dialogues & few revelations of which few of us will not be aware of regarding the education system. The film offers a sly tribute to a unique strain of the Indian entrepreneurial spirit. It involves finding loopholes in systems and institutions and plugging them with thick wads of rupee notes. Soumik Sen’s story has every potential of being a solid blockbuster having a massive connect. Whoever has read or heard about the film somewhere knows what the story will all be about, but yes, there are certain revelations coming in as a surprise. Emraan Hashmi’s performance saves the movie from falling into a totally unbearable zone. Alphonse Roy’s camera few saying is wobbly in many sequences that its angles are so weird that they derail you from a good scene, but remember only according to few. Soumik Sen along with Mishkka Shekhawat pen some very interesting dialogues adding to the pluses of the film. Yes, there will be people bashing some factual aspects of the film – why can’t you just enjoy the fun? Emraan Hashmi – This man can carry a cliched moustache better than anyone else around. He just tricks you into his charm and makes you believe that he must be the same in real life too. As Rakesh Singh, he’s wicked and grey. He convinces you to trust him that he’s this era’s Robinhood. Shreya Dhanwanthary is outstanding in the second half; don’t miss out on her in a breakdown scene. She looks & acts cute but excels in the scenes that demand the display of expressions. Snighadeep Chatterjee as Sattu delivers a believable and important performance. You can see a genuine and sincere Engineering student in him without any gimmicks. Manuj Sharma as Rakesh ’s friend Bablu is a very good actor and we know what he can bring to the table. Special mention for the actress who plays Emraan’s wife in the film, her character is hilarious and we deserved more such ones. The omnipotent scamster is hard to avoid or evade. He has his men in every college and coaching centre, and the right political connections to allow him to escape when things get hairy.The movie also casts our Uttar Pradesh’s prominent artist Gaurav Dwivedi as ‘Jatin’ potraying what our current system is like. When a masters in business administration degree becomes the next big thing to aspire to, Rakesh smoothly ups his game, reasoning that there is even more money to be made when the engineer and his chief executive officer are both beneficiaries of his schemes. Whoever said intelligence had anything to do with academic achievement? Soumik Sen’s direction is very run-of-the-mill . If you see from the eyes of a layman, there are no major complaints. He could’ve done better with a better script in hand. None of the songs click apart from Mohan Kanan’s Kaamyaab. The sad version of the song, which isn’t in the album, is amazingly penned by Juhi Saklani and it just helps you to build an emotional connect with certain scenes. Neel Adhikari’s background score is ordinary. There are some sound effects used at places which just levels down the quality of those scenes. 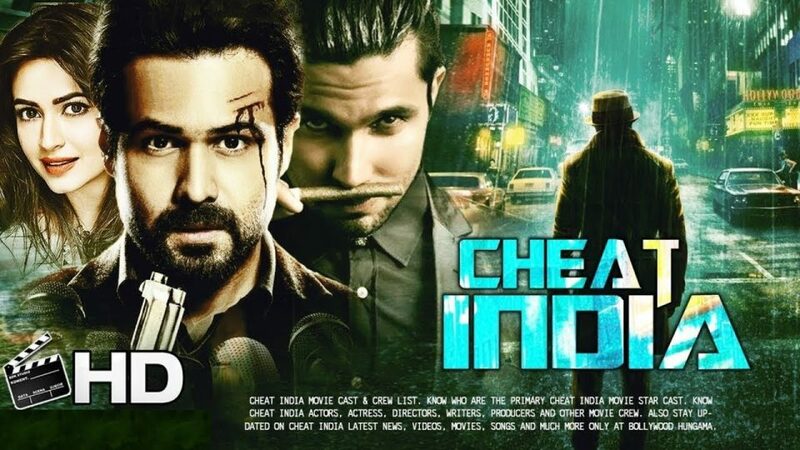 All said and done, Cheat India is informatively entertaining and Emraan Hashmi makes sure to maintain this throughout. Yet another, honest attempt by Emraan to prove why he can do a lot more. Skipping the preachy route, the movie just delves into a fun zone and that’s where it wins some brownie points. 3.5 stars is our verdict…..Do let us know your reviews for the movie. Reporter : Why Cheat India Movie Review:Exposes the malpractices, scams and flaws in the Indian education system. Bharat Teaser Unveiled by Salman Khan- The Sultan Of Masses Is Back! कपिल के शो पर हुई चन्दन की वापसी, किकू शारदा ने किया स्वागत! दिव्यांका त्रिपाठी का डाई-हार्ड फैन लिखेगा उनकी बायोग्राफी! Read what stars have to say after watching “Raagdesh” !